AI uses Image recognition learning processes to go through thousands of images and "learn" which images belong to which category. 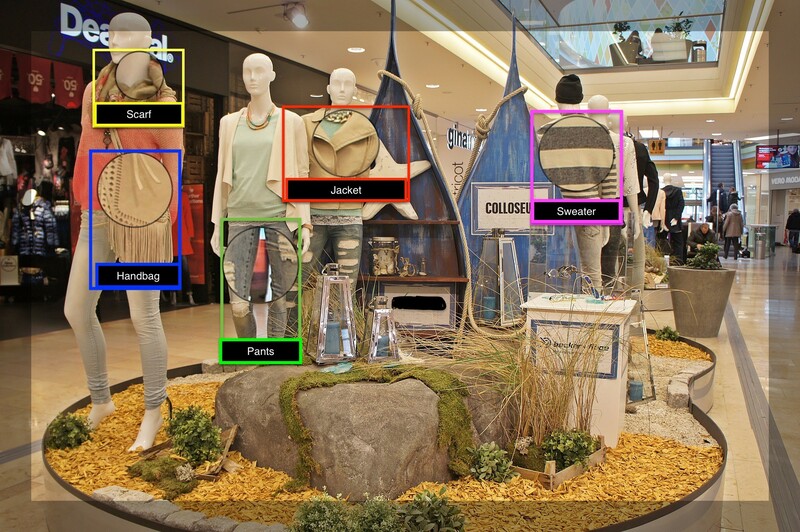 My example program uses the MNIST fashion dataset to sort through the images of clothing types (jackets, shirts, pants, dresses etc.) and accessories (handbags, shoes etc.) to classify the images into their proper categories; the program also saves the model and then re-uses it. 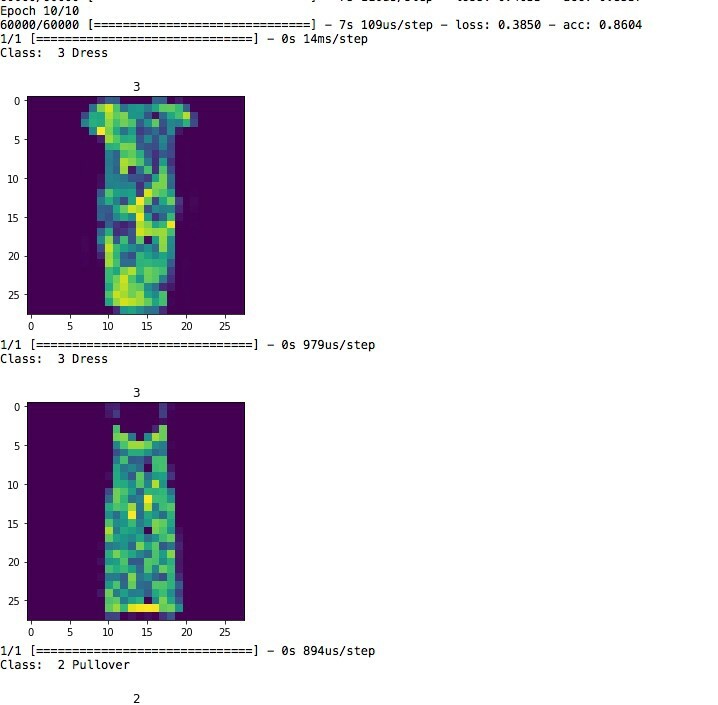 I also use a key-value pair process to map the clothing code to the description and loop through samples of the testing data to pull and view some of the images and the predictions for those images. I chose Keras as it is easy to learn and use. 1.  import the libraries and modules - tools required to run the program. 2.  load the mnist fashion dataset into x_train, y_train, x_test and y_test sets - divide the data into training and test (program tests its predictions against test data and gets better at learning for optimal results based on defined parameters). 3.  preprocess the data and class tables - turns the datasets into more standardized, program readable sets. 4 . Define the model architecture - tell the program which parameters to use and methods to use for learning; define the input shape. 5. Compile the model - configure the learning process for the program. 6. Fit the model to the date. 7. Save the model for future use - (I saved the model on first run and re-used it on subsequent runs, commenting out the save step). 8.   key-value pair - map the label code to a description that people can make sense of (eg, 4 = Coat, 8 = Bag). 9.   added a range - pulled out sample images from the test data to view the image and the program's prediction of what the image is. The code is listed below; if you are more interested in parts 8 and 9 (key-value pair and view sample of test image files and predictions), scroll down. There are different ways to define the model in Keras - sequential, functional. I selected Sequential model as it is simpler and fits our needs for this program. Basically, each model layer is built from the preceding one, adding to the learning process, as the name implies. The purpose of choosing modeling architecture is to find the best way for our program to learn. The first layer gets information about input shape; following layers infer shape automatically. The layers use the "relu" or rectified linear units, which is one way for the program to learn. The last layer uses the 'softmax' function, which sums up probabilities for our desired output. (8) Key-value pair: A map for easy readability: Descriptions are easier for humans :). This is more for the output than anything else. 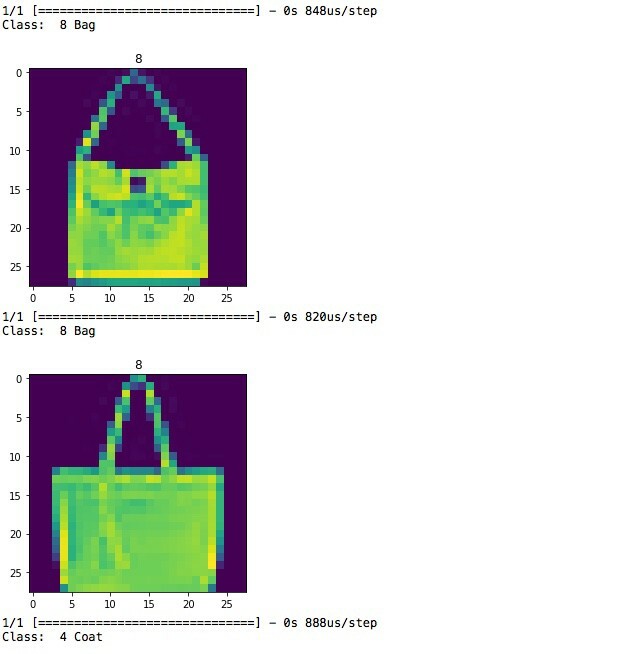 (9) range (for loop) to select several sample files from the test dataset, and have the program predict what image it is, and print the image as well as see for ourselves. It is good to see some samples and predictions paired with the images, these programs can get complicated as they scale up. Visualizing makes it easier to understand, I think. I broke the code into snippets for better explanations. If you liked this, please let me know by clicking on clap! I am interested in AI, Machine Learning and its value to business and to people. I occasionally write about life in general as well.